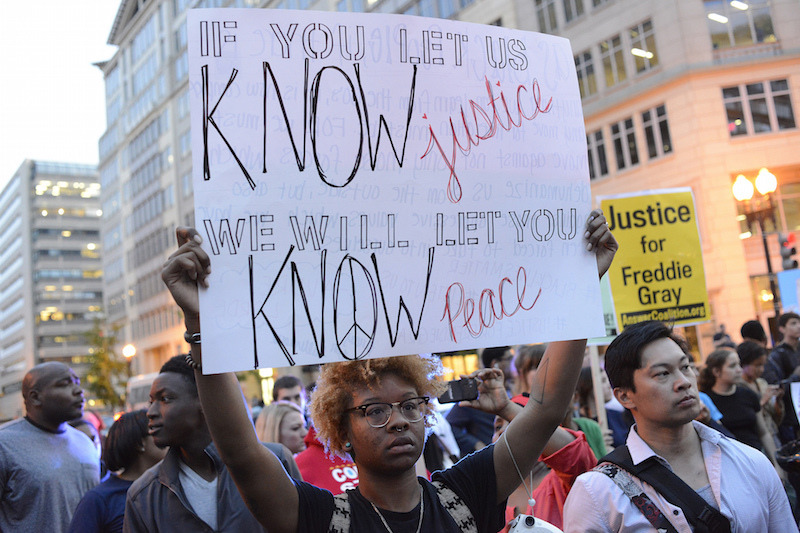 A 2015 protest calling attention to the murder of Freddie Gray. Photo by Stephen Melkisethian (Creative Commons). This week, Aiyana Stanley-Jones would have turned 14 years old. Her family would be planning a birthday party. I say “would have” because six years ago, the 7-year-old was shot and killed as she slept on the couch in her grandmother’s living room. The gunman? Detroit police officer Joseph Weekley, who was part of a SWAT team that burst into the grandmother’s house in the middle of the night looking for a murder suspect (the police were in the wrong place—the suspect lived in the apartment upstairs). Weekley was indicted on manslaughter charges and brought to trial twice. But each time, the jury failed to reach a verdict, causing the judge to declare a mistrial. After the second mistrial, the prosecutor dropped the charges. Weekley’s acquittal is not exceptional. The criminal court system, which has convicted and incarcerated millions of people, has not prosecuted police and law enforcement with the same zeal. So should it surprise anyone that today a fourth police officer was acquitted for the murder of Freddie Gray? 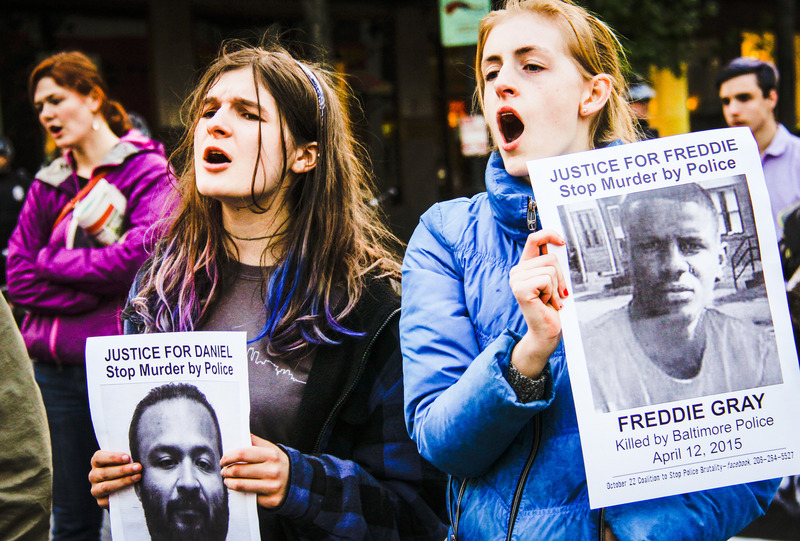 There have been too many police killings, so here’s a brief reminder of Freddie Gray’s case. In April 2015, Gray was a 25-year-old Baltimore resident. That month, Gray was arrested for carrying a switchblade, cuffed with his hands behind his back, and then placed in a police van on his stomach and without a seat belt. He was taken for a “rough ride,” a ride in which the driver takes sharp turns, causing the person in the van to be thrown around without the ability to hold themselves steady. The ride injured Gray’s spinal cord. By the time the van stopped, he was unconscious. Seven days later, he was dead from those injuries. The state’s medical examiner ruled his death a homicide, and State’s Attorney Marilyn Mosby charged six officers in his death. 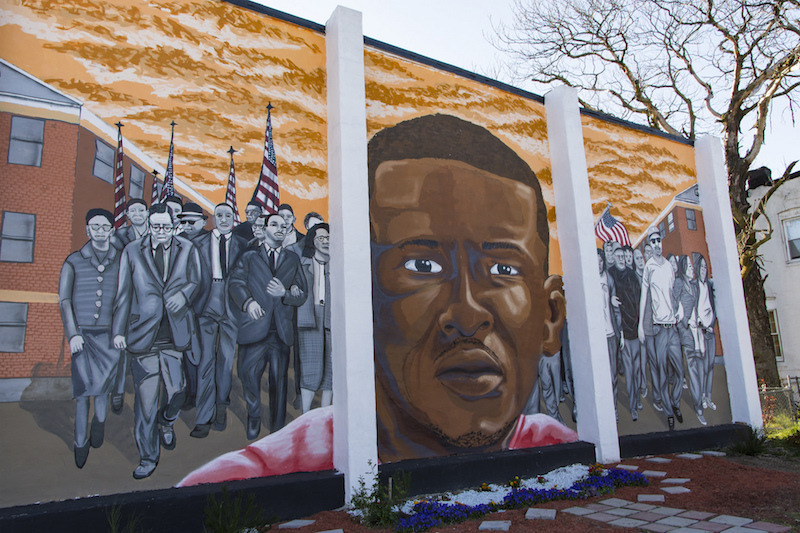 A Baltimore mural commemorating Freddie Gray. Photo by SocialJusticeSeeker812 (Creative Commons). Filing charges against people who have caused harm or death to others shouldn’t come as a surprise. But it is when the person causing the harm or death is a police officer. Keep in mind that in 2014, when New York police officer Daniel Pantaleo placed Eric Garner in a deadly chokehold and Ferguson police officer Darren Wilson fatally shot Michael Brown, neither officer was indicted. On the exceptionally rare occasion that a police officer is indicted, it’s still very unlikely that they’ll be convicted. It’s even more unlikely that they’ll ever serve jail time for murder (see case of rookie cop Peter Liang, who shot and killed Akai Gurley). This morning, a Baltimore judge acquitted Lieutenant Brian Rice of involuntary manslaughter, reckless endangerment, and misconduct, stating that the prosecutors had failed to meet their burden of proof beyond a reasonable doubt. Rice’s acquittal demonstrates, yet again, that justice for police killings won’t be found in the criminal court system. It’s a lesson learned firsthand by the still-grieving and outraged families of Eric Garner (whose daughter led a 300-person protest in Staten Island yesterday on the second anniversary of her father’s death), of Aiyana Stanley-Jones, of Tamir Rice, and of countless other families. The list goes on and on. “We’re at a point where people are understanding that the current system, as it’s organized, is incapable of delivering what people consider to be justice,” Kaba told me. She pushes people to question what they consider justice and to move beyond punishment (in the form of criminal prosecutions and prison sentences) to accountability. What are some forms that justice might take, outside of sending people to jail? True, passing these measures might be an uphill battle with police unions fighting tooth and nail against each. But how is that any different than the battles already being fought—and lost—in the criminal court system? The current criminal court system has so often delivered absolutely nothing to grieving families. At the very least, families whose loved ones have been killed by police officers should be able to rest assured that the person who pulled the trigger won’t get the chance to do so again.